A development team member asks: Can landing page gadgets help me understand the structure and processes of an application, and let me monitor how the application is evolving? The Designer Studio supports Pegasystems' implementation methodologies by linking requirements, use cases, actors, and work types together in an application rule. 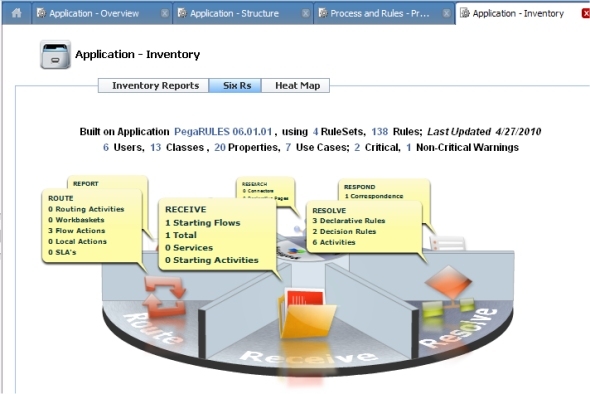 The application rule links together rules that primarily describe the application's business dimensions (captured by DCO tools) with the RuleSets that implement the application. In this example, the ESupply application consists of four RuleSets, and the application is built directly upon the base PegaRULES:01.01.01 application. This article introduces eight gadgets — accessed from the Pega button ( ) — that can help you gain an application-wide perspective on the currently selected application. To see a list of all gadgets available to you, select the Pega button and click Show All. For details about each of the 50+ gadgets in V6.1, consult the help system. Before using these gadgets, set the application you want to study (from those available to you) as the current application. From the application menu on the header bar, select Switch Application > (application). Note: Although the examples described here involve only review —not update —of the application rule or other rules, many landing page gadgets do offer update capabilities. Select > Application > Overview > Work Types and Use Cases to view the work types in the application and the use cases associated with each work type. 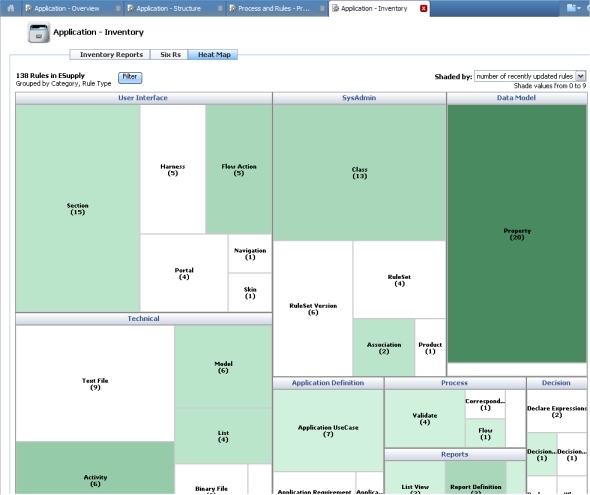 This information, maintained by a business architect, identifies the individual use cases that are involved in each major type of work in the application. 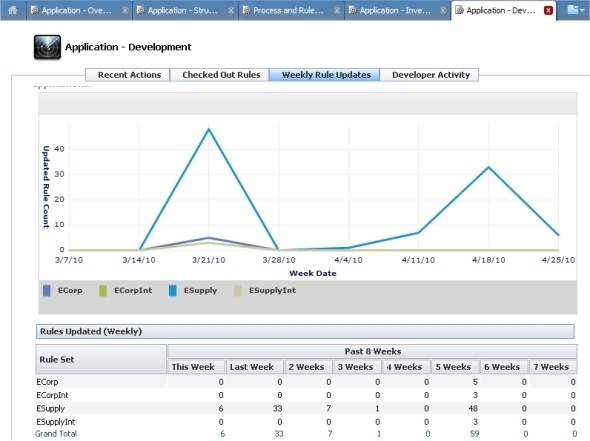 See DCO 6.1 - Working with Application Use Cases. 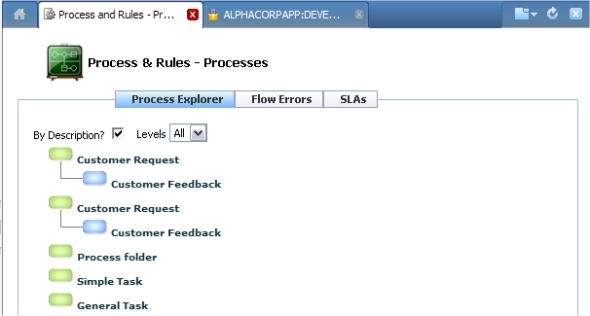 Select > Process and Rules > Processes > Explorer to identify the starter flows and other flows in the current application. A starter flow (green box) creates a new work object. A subflow is called by one or more other flows and typically does not create a new work object. Select > Application > Inventory > Heat Map to present counts of rules grouped by rule type and by the categories used in the Application Explorer and Rules Explorer. A larger rectangle indicates a higher number of rules of that type, A white or lighter green rectangle marks those rule types that have not changed recently. Darker rectangles identify the rule types with recent updates. Click a rectangle to drill down to detailed listings. 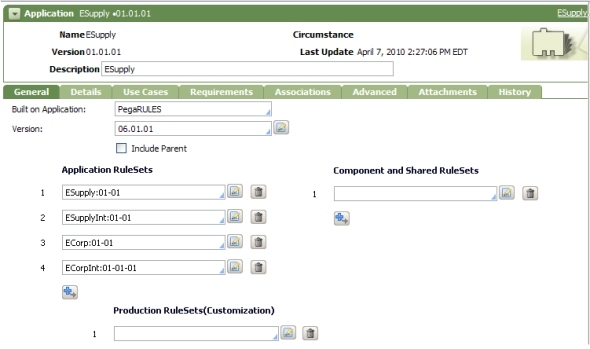 Select > User Interface > User Screens > Portals & Skins to view the portal rules in your application, the associated skin rule for each portal, and counts of how many access groups (and how many operators) are associated with each portal. This display can confirm that users have a portal consistent with their roles and responsibilities. Select > Application > Structure > Access Groups & Users to identify the access groups that reference the current application. Select one access group to identify the operators (if any) that reference that access group. Clipboard pages are referenced by name on the Pages & Classes tab of activity rules, harness and section rules, and other rule types. Page names are case-sensitive; it is important that spelling and capitalization are uniform in all references to a specific named page. Select > Data Model > Clipboard Pages> Named Pages to identify, by work class, a list of the the pages explicitly referenced in rules that apply to that class, and count of the rules that reference the named page. The four gadgets in the Development landing page provide insight into the pace of evolution of the application (all RuleSet versions), and who is making the changes. For example, select > Application > Development > Weekly Rule Updates to chart the number of rules modified, by RuleSet, for each week in the last 8 weeks. Drill-down to details as needed.